Combat Mission is based on the extremely powerful proprietary CM2 game engine, a much improved and expanded second generation of Combat Mission products. As with the original Combat Mission series, the emphasis is giving players a highly playable game that is as fun as it is detailed. First used in the Combat Mission: Shock Force series, the game engine has been refined and evolved with years of additional development, tweaking and improvements based on customer feedback. If you have any interest in Soviet equipment and forces, then this is the one for you! Often times big, armor-heavy battles feel out of place for their historical setting. Here it is almost the norm. 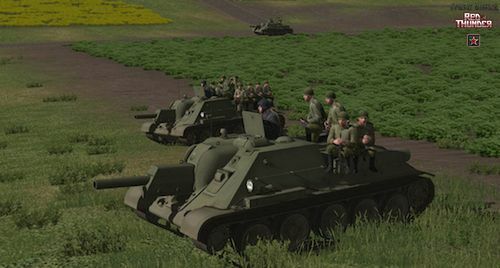 Explore the Soviet formations and find out for yourself how different they are to command than what you're used to. Lush, wide open maps dotted with large swamps (or vice versa!) present players with battlegrounds unique to Combat Mission. Two Regions within the game help set the mood with Ukrainian/Belarusian and Polish themes. Players are assigned detailed missions to accomplish based on a richly diverse set of Objectives. Missions can be played in either Real Time or our novel WeGo hybrid turn based mode introduced with the first Combat Mission game 20 years ago. WeGo allows each player to plan out 60 seconds of combat and then watch as both sides' commands are carried out simultaneously. The WeGo system also allows for re-watching turn action and playing against another player by email (PBEM) or "hotseat" on a single computer. RealTime and WeGo head to head play can also use TCP/IP on a LAN or over the Internet. Massive replayability comes from a unique Quick Battle system which allows players to purchase their own custom force and fight over the battlefield of their choice from a wide array of different maps. A powerful map and scenario Editor allows you to create battles or campaigns for yourself and others. All units are portrayed one for one in 1:1 scale in high resolution polygon 3D models with articulated suspensions, animated hatches, and other features that make them feel real. Unlike other 3D tactical wargames, Combat Mission combines real world physics with a thoroughly researched portrayal of forces, right down to what the individual soldiers cary into battle. Advanced vehicle damage modeling allows for tracking of each sub-system, including the most realistic ballistics, armor and post-armor effects available in any game. Unlike other games that claim this level of realism, Combat Mission actually delivers it across the whole spectrum of warfare, including the interaction of weather, lighting, and terrain on how units and their weapons function. Perhaps the most important feature of Combat Mission is its detailed and innovative portrayal of "soft factors". Experience, Morale, Leadership, and other elements operate at the individual soldier level and collectively transform how units behave. As important as these battlefield concerns are, most other games give them short shrift or don't bother covering them at all. In the real world having the best weapons means nothing if the soldiers crewing them are balled up in fear or are too distracted to see what's going on around them. Weapon penetration values and armor protection are based on extremely detailed real life data and scientific algorithms that are specific to exactly what is seen in the game. There are no arbitrary values (hitpoints) or precalculated resolution tables (CRTs) that so often produce frustratingly inaccurate results. The advanced Tactical AI (TacAI) models the psychological state and inherent qualities of every soldier on the battlefield, allowing for genuine battlefield behavior from every soldier as if they were their own free thinking individual. All of these elements, and many more, seamlessly fit together to create the most realistic battlefield experience out there. The realism level isn't pushed in your face with lots of data and obscure references. Instead players experience all of this with the 3D graphical environment. Combat Mission's visceral game environment is what attracts players, the richness of the gameplay is what keeps them playing for years on end.